It's time to translate a menu in German. Bills of fare in Italian, French or other languages will have similar characteristics. Use your phrase book and hope for the best. Many waiters and waitresses speak English and can be of great help. It's best to just dive in and have fun! It's time to visit Munich, Germany, and enjoy a fine dinner at Kuczinsky's. Here's the menu for you to peruse at your leisure! 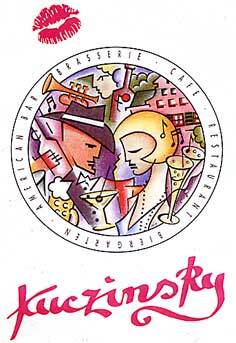 Kuczinsky's is an "American" Style Brasserie (an unpretentious restaurant or tavern that serves drinks, especially beer, and simple or hearty food), my kind of place. I was browsing through the menu when I thought it would make an excellent travel topic. That is, I'll translate this menu (as best I can.) It reveals the inner workings of a well-written German bill of fare. I hope this helps you in your next restaurant adventure with a menu that's in an unfamiliar language. Get out your phase book and get to work!